What does this image have to do with children’s books? Plenty, as I’ll explain shortly. * explains why my eighteenth birthday left me bleary-eyed, muddle-headed, reeking of smoke, and addicted! Eric wondered about the double-sticker -- and why it was blue. Nowadays, the foil stickers on every Newbery and Caldecott winner are gold, but there was a time when color occasionally appeared on these stickers. Here is the sticker that appeared on the 1943 Newbery winner, ADAM OF THE ROAD by Elizabeth Janet Gray. Not only did they add color, but they also included the author’s name on the sticker. In addition to the blue Caldecott seal on TIME OF WONDER, I have seen a green Caldecott on Robert McCloskey’s MAKE WAY FOR DUCKLINGS and am fairly certain I’ve seen red stickers on one or two older Caldecotts. As for the double, or overlapping, stickers, I have never seen such a thing on a Newbery winner, but I have seen it on a few Caldecotts, though it’s pretty rare. What do these two stickers represent? Both sides of the medal. Yep, the actual bronze Caldecott Medal, which most of us never see, has engravings on both sides. The back of the medal is a scene from SING A SONG OF SIXPENCE and shows a man carrying a pie from which some of the four-and-twenty blackbirds are escaping. The name of the winning illustrator is inscribed below this illustration. The Newbery Medal has two sides as well. The front depicts an open book, with the phrase “For the most distinguished contribution to American literature for children” emblazoned across it. In addition to the designing these two major book awards, Mr. Chambellan illustrious career included creating archictectural sculpture for the Russell Sage Foundation Building, the Chicago Tribune Building, Rockefeller Center, and many other landmarks. I was shocked to discover that the designer of Newbery also did the sculpture for this mammoth tower at the Shrine of the Little Flower, which is just a few miles down the street from where I work. Back in the thirties and forties, controversial Father Charles Coughlin used to broadcast his infamous and anti-Semitic radio program right inside this very tower. I’ve driven past it thousands of times and never knew this tower had any connection to the world of children’s books. Looking now at some of Mr. Chambellan’s other creations, I find myself seeing portents of future Caldecott winning books. 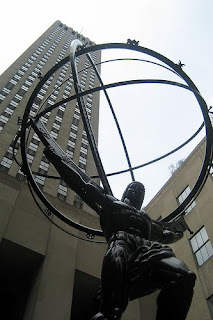 This Rockefeller Center statue of Atlas (designed by Lee Lawrie and modeled by Rene Chambellan) made me think of the 2010 Honor Book, ALL THE WORLD. The back of the statue? The 2005 winner: KITTEN’S FIRST FULL MOON. Can a book be named a Newbery Honor if it only receives two votes? That’s what happened when Cornelia Meigs’ WINDY HILL was named a Newbery Honor in 1922. 1922 was the first year of the award and the selection committee was comprised of four officers from the American Library Association, as well as four important librarians including (who else) Anne Carroll Moore. In preparation for the awards, librarians across the country (not just children’s librarians) were invited to nominate titles. Only 212 votes were received. (Can you imagine how many thousands they’d get today...especially if the award were publicized on the net?) Of those, 163 went to THE STORY OF MANKIND by Willem Hendrik Van Loon. Twenty-two went to THE GREAT QUEST by Charles Boardman Hawes. CEDRIC THE FORESTER by Bernard Marshall got seven, William Bowen’s OLD TOBACCO SHOP got four, and Padraic Colum’s THE GOLDEN FLEECE got four. WINDY HILL got two votes, followed by nine other titles which received one vote each. I’d sure love to see a list of those nine titles. That two-vote getter, WINDY HILL, remains one of the most elusive Newbery titles of all time. I don’t think I’ve ever even seen a copy. Once in a while an ex-library copy in a later printing turns up for sale, but even those are priced at a couple hundred dollars. One of the reasons the Newbery and Caldecott Awards were created was to bring more attention to children’s books. They’ve succeed in that regard. Everyone seems to know the “Newbery” and “Caldecott” today. ...They just can’t spell them! Publishers Weekly reports that the twin protagonists of the “Sweet Valley High” series are staging a comeback. With over 500 titles, the series was hugely popular during the eighties and nineties...before interest lagged and the series got buried down around Fear Street. But now there’s a film in the works, to be written by Diablo Cody, who won an Oscar for JUNO. And next year St. Martin’s Press will be publishing SWEET VALLEY CONFIDENTIAL, an adult novel that tells what happened to Jessica and Elizabeth when they grew up. Back when I turned eighteen...in the last century...when (gulp) Gerald Ford was president...my cousin gave me an unusual birthday present. It marked a rite of passage...something that young people weren’t allowed to do before they turned eighteen and became, in the eyes of society and the law, brand-new adults. My cousin picked me up early that evening and we drove to our destination. Three hours later, I emerged -- my head swirling and my clothing reeking of cheap perfume and tobacco. I wasn’t sure what had happened...but I wanted to go back. My cousin had taken me to the local YMCA to play bingo for the first time. Back then you were not allowed to enter a bingo hall until you were eighteen years old. Even if it was at the Y. It was a whole new world for me. Everyone there was puffing on cigarettes (except for me and my cousin) and clouds of thick gray smoke hung low over the bingo tables like polluted air over an LA freeway. Every bingo player seemed to have good luck charms and amulets spread across the table in front of them -- and they usually performed elaborate rituals with them (tugging on the blue hair of a troll doll, kissing a school picture of one’s granddaughter) before each game. My mind was spinning with numbers, numbers, numbers as I smacked the ink dauber aganst my cards, trying to keep up with the caller. Meanwhile, my normally calm cousin began sobbing hysterically when she realized she needed only one more number to win the “Big X” game. When someone else yelled "Bingo!" before her number was drawn, she ran to the bathroom and threw up. I think I won $2 that night. ...But that was all it took. After that I was hooked and we went to play Bingo many nights after that. That particular obsession only lasted a few months. I got tired of the second-hand smoke, the noise, and the just-below-the-surface anger of the bingo players who, I honestly believed, might kill someone who yelled "Bingo!" before they did. Besides, I never seemed to win after that first night. But I wonder if I’d return to my gaming ways if some local Y offered children’s book bingo. I just discovered a website that allows you to make topical bingo cards on your home computer. The literature series includes bingo games based on Beatrix Potter characters, Beverly Cleary books, as well as Dr. Seuss, Mrs. Piggle-Wiggle and Mother Goose. I think I’ll ask the Y if they’ll quit using numbered Bingo cards and start playing these more literary games. ...But first I’d better bone up on my Newbery and Caldecott titles. Both games include a book called “Free Space” in the middle square and I’ve never even heard of that title! Thanks for visiting Collecting Children’s Books. Hope you’ll be back. I always want to put an extra "r" in Newbery, I'm afraid.